I have been running on and off for a fair while and I was hoping to increase the distances that I was running. At the time I was running 6km two or three times and week and 12km once a week. My aim was to increase the distance I was running to a consistent 12km at least twice week. Unfortunately sore ankles, knees and shin splints would prevent me running much more than one 12km run each week. In November after trying to increase my distance I needed to take much of the month off from running so my ankles and shins could recover. I did a bit of investigation and found the talk about barefoot running interesting and it could be a potential solution to my running problems. 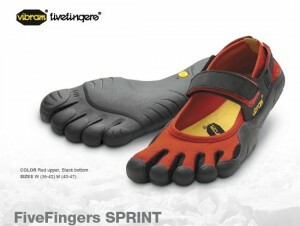 At the end of last year I bought a pair of Vibram FiveFingers Sprint running shoes. Pretty much the first reaction of seeing these shoes are ‘boy they are ugly’ although often the f word is in that description. However I didn’t get these to win the fashion stakes but to running on a consistent basis. Vibram makes a range of shoes, and I was looking at either the Sprint or the KSO, both shoes are designed to fit securely to the foot with straps that can cope with the stress of running. The decision of which to buy was made by the Sprint being the only one I could get locally in Australia. 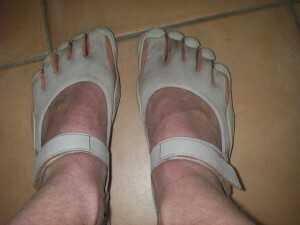 I bought these from Runner’s World in High St Kew (Victoria). I would definitely recommend trying these shoes on before purchase as the correct fit is quite important. Also depending on your foot shape some women end up with the men’s shoes and men with womens. Unfortunately the price in Australia is approximately double the price from the US. As you can see from the above photo the shoes provide only basic protection the elements. There is no cushioning or support for your foot. The basic aim is that these shoes are aimed at protecting you from the gravel, glass, rocks, whatever else might get you if you were running barefoot. 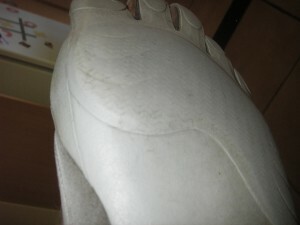 The sole of the shoe has razor cuts in it much like deck shoes and provides a good level of grip. Only running fast around the tightest of corners and you can feel the shoes moving, and it is not the sole but your foot moving a little bit inside the shoe. The shoes do get grubby, especially if it is wet or muddy on the run. However the shoes can be thrown straight into the wash, just remember to do up the velcro straps or you will find them attached to all of the washing in the machine. It is a good thing that they are easily washed, as running without socks on means that they get pretty sweaty and very stinky quite quickly. Getting the shoes on is a little bit tricky. My deformed little toes don’t particularly like getting into these shoes and needs to be wrangled into the correct ‘finger’. While they look like these shoes simply slip on, it does require sitting down to get them on. Once on I find that I need to walk around a little bit before doing the straps up. Doing the straps up needs to be while standing, if you sit down you end up pushing your foot too far forward in the shoes and the straps will be a bit tight. 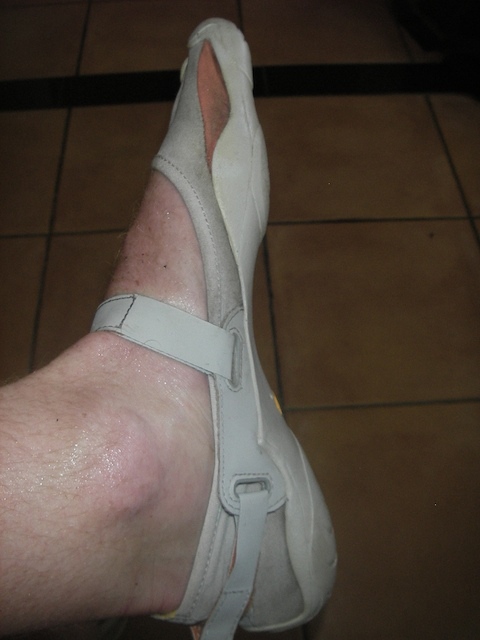 As I bought these shoes in the height of summer I had been walking a fair bit bare foot so I was hoping the transition to barefoot running would be a simple one. The first couple of runs went fairly well, except that I didn’t have the straps done up tight enough. The shoes rubbed quite a bit and I got some blisters on the sides of my feet, toes and heel. My first runs were around the 3~4km mark and felt really good, the sensation of feeling the surface I was running on is incredible, you feel much more connected to the environment you are running in. After a couple of weeks of running one or two times in the Five Fingers I extended my run to 6km, and I could feel the muscles in my calves getting an extra work out. The theory is that you are using the muscles to stabilise your foot instead of relying on the cushioning of the shoes. Over summer I did a couple of longer 12km runs, with good breaks after each run. Part was let my feet and running style change and part to allow my fitness to increase as well. One concern I have had with the Sprint was I was worried about gravel and sand getting into the shoes. Once or twice I have had a small piece of gravel in my shoe, but no major problems with stuff getting into the shoes. This includes running on a sandy tracks and along a beech without any issues. The only thing I have had a problem with is long grass can get caught between my toes. Mud is interesting to run through, depending on the thickness, a quick rinse under the tap at the end of the run removes any mud from the shoes. The course I run is a mix of concrete footpaths (50%), asphalt (30%) and gravel/grass/mud (20%) and the shoes work well on all surfaces. Grip on asphalt is exceptional, and concrete is as good as my previous running shoes as long as it is clean. On gravel, grass and mud the ability for my toes to spread as they are in the individual fingers means you have fantastic grip, and the feedback from the shoes means you can respond if you haven’t got your foot firmly planted. Over summer I worked towards running a consistent 12km course, and I am now able to comfortably running a 12km course 5 days a week. There was no chance that I could have come close to this distance without considerable pain in the past. For anyone who runs on a regular basis I would recommend that you give barefoot running a try. Vibram FiveFingers aren’t the only choice, Nike have a number of shoes in their Nike Free range which simulate barefoot running and are probably a gentler way to get into it.